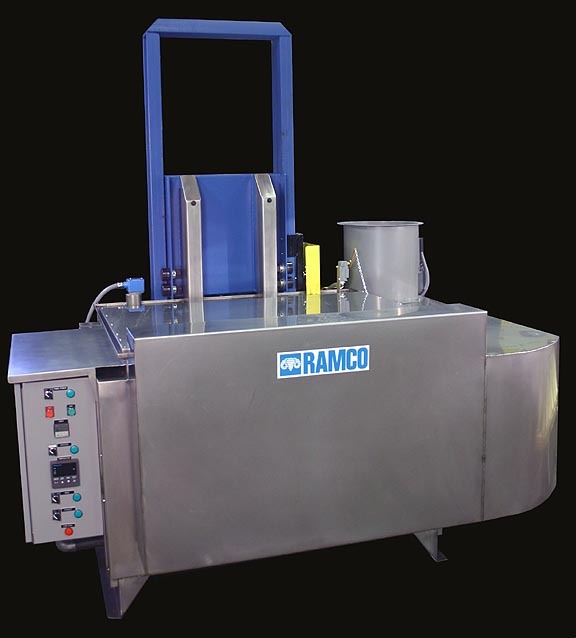 The RAMCO Caustic Leaching System has been used by many companies over the last 20 years for the removal of shell residues after investment casting. The system uses a highly concentrated bath of KOH or KOH/NaOH (approximately 35 to 50 percent) at temperatures close to the boiling point for the solution (approximately 230 to 250 degrees F) to slowly break down fused silica shell residues from investment castings. Although the process is slower than a molten caustic salt bath (normally operating at 1000 degrees F and 100% caustic) it is much safer and gentler to the castings and environment. The unit above is designed for a 2000 pound load and a volumetric footprint of 45″L x 30″W x 15″H. It has a 255 gallon capacity and includes a lip vent exhaust system. The tank is built of heavy gauge stainless steel with exterior stainless steel insulation panels. A Nema 12 rated electrical enclosure includes selector switches, pilot lights, digital indicating temperature controller, digital cycle timer and lockout-tagout disconnect switch. An automatic opening and closing cover is included to reduce emissions and save on energy. The elevator is made from heavy wall stainless steel structural tubing. The tank is double V pitched for ease of cleanout and electric heaters side mounted to keep away from the slurry that forms at the bottom of the tank. 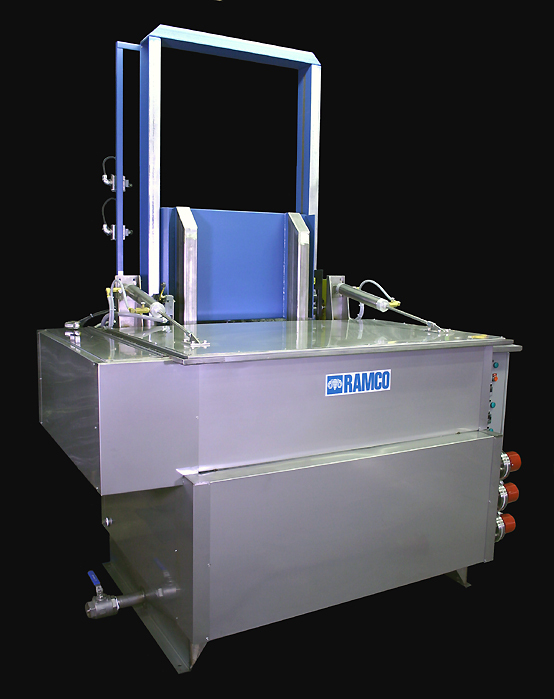 A larger RAMCO Caustic Leaching System is shown below. It has a load capacity of 1000 pounds and a working volume of 56″L x 31″W x 27″H with a 475 gallon solution capacity. This system also includes a V pitched bottom and a side mounted settlement chamber. A automatic pneumatic cover is sequenced with the automatic cycle timer and process cycle. 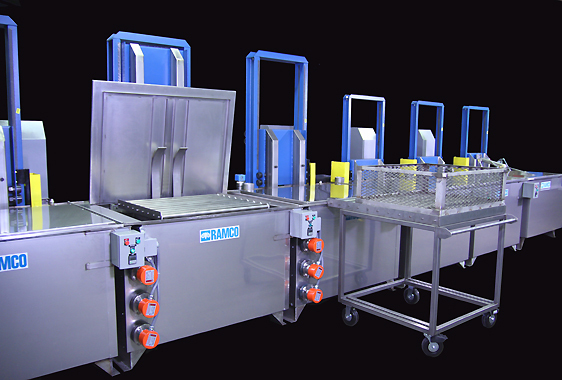 RAMCO Caustic Leaching Systems can be arranged for multi-stage processing as shown in the six stage line below. The system includes three caustic leach tanks two rinse tanks and a hot air knife blow-off dryer. Designed for high throughput this line includes a roll-around cart for front load/unloading of baskets. Each stage has a load capacity of 1000 pounds and a working volume of 36″L x 32″W x 12″H. All tanks have pitched bottoms to facilitate cleanouts. The covers are sequenced with the automatic timers controlling the process cycle. Special features include front mounted controls, flanged mounted heaters, and a combined cascading rinsing and water make-up system (not shown) that conserves water while automatically keeping all leach tanks at the correct operating levels.